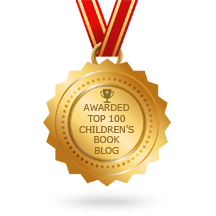 Nicola Davies has penned some terrific science books. I really like Surprising Sharks! and Gaia Warriors. 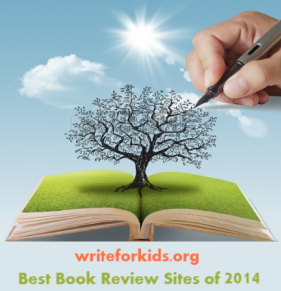 Davies excels at explaining the natural world and our relationship with it. Tiny Creatures: the world of microbes, is an informational picture book that presents a simple introduction to the smallest things on our planet and the big jobs they do. Invisible to the naked eye, microbes come in many different shapes and sizes. They don’t have eyes, heads, or legs, branches, roots, or leaves because they aren’t animals or plants. Microbes are responsible for slowly changing things into something else. Not only do they help to turn everything that dies into soil, but, they are also responsible for turning milk into yogurt. Davies reassuring, matter-of-fact tone allows the youngest readers to appreciate the ginormous number of microbes – right now there are more microbes living on your skin than there are people on Earth, and there are ten or even a hundred times as many as that in your stomach – without becoming alarmed. Partnering with the easy to understand text are the watercolor illustrations of Emily Sutton, which perfectly mirrors what is being explained within the text. 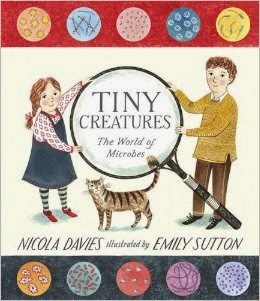 Pair Tiny Creatures: the world of microbes with other books by Davies. Maybe, What’s Eating You? : parasites---the inside story.